Billion dollar businesses have grown out of apps. Mobile apps account for 57 percent of all digital media usage (yes, all). Despite this amazing adoption, we’re still far from reaching the peak of app development — and if you’re like me, that should make you really excited. This past year has seen major advancements for digital product teams, and it’s only getting better. Apps are going to become even more powerful and performant as technologies we have long waited for are reaching maturity and are finally ready for prime time. This won’t come without its own challenges though, as product teams will have to be laser focused on the goals of the product, and not just diving into the latest shiny tech. As we head into 2018, here are six things mobile app developers should be looking forward to — and watch out for. As technologies like React Native and Xamarin continue to mature, cross-platform strategies will become a main development approach. 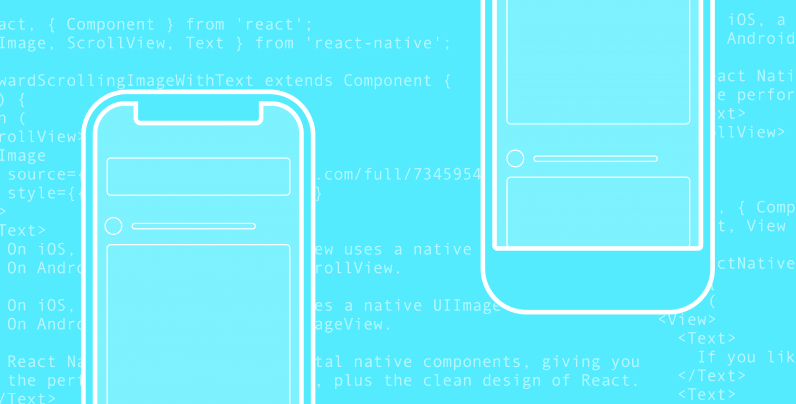 Those familiar with React for web development will find a natural fit with React Native, and it will allow for developers traditionally focused on web to get their hands on mobile. Similarly, those on the Microsoft stack will find it intuitive to transition to Xamarin. In 2017, almost all of the apps my team and I built were React Native — a major change from just the year prior. This approach brings new cohesion to digital ecosystems, which can share a codebase and reduce maintenance. As cross-platform strategies become more popular, expect mobile development teams to change in structure. In practice, React Native requires teams to stop thinking purely in terms of iOS and Android — instead of separate teams, they function as one app team. Developers work as much in React Native as possible, and jump to native as needed to integrate with OS-specific requirements, such as Apple Pay. Teams that successfully reorganize will not only gain efficiencies in maintenance, team cost, and development speed, but will be able to leverage a wider pool of talent (including web developers). For my company’s teams and our clients, I advocate for creating core React Native app teams, with one or two native developers that can jump between React Native and iOS or Android. More and more apps and systems will move away from traditional REST APIs to query-based APIs such as Falcor and GraphQL. This will open up a whole new world of flexibility in app architecture while simultaneously making apps faster and more efficient. Query-based APIs enable smarter, more flexible integrations between the app to the server and any back-end services. This way, you can be surgical in picking exactly what you need from a service, whereas the traditional approach would sometimes require downloading much bigger datasets. With REST APIs, making one change impacts the entire app — and creates a deployment hurdle. With GraphQL, developers can make changes one step at a time, fine-tuning the services they need and how to combine them. Conversational experiences, chatbots and voice UIs will continue to be trendy. But the key is in how brands find more purposeful ways to engage conversationally — to provide faster more efficient customer service, make a purchase flow more personal, or provide a more contextual experience. This will span bots as well as conversational interfaces; expect to integrate with Watson, Amazon Lex, Facebook Messenger Bot, or Kik. Product teams will have to decide whether they want to own the experience within their apps, or if they want to leverage existing channels like WeChat and WhatsApp. My take? When companies can find meaningful value in creating a conversation, they will integrate it into their core service. A distributed ledger that provides immutability to data — there’s no question blockchain technology holds exciting and promising possibilities. It can certify sources, maintain identities, and provide added security. But, it doesn’t come without some trade offs either. For instance, one drawback of using a blockchain is due to its very nature. Because it’s distributed, blockchains can be slow and hard to manage. We’ll see some interesting applications when it comes to certified products and moving assets over the coming years — but I wouldn’t write off immutable cloud-based databases alternatives just yet. Even a few years ago, deep learning was only being explored by PhDs and experimental labs. But now, tools like Google’s Tensorflow and the many open source Python libraries are making deep learning more widely accessible, especially as more toolboxes become available to play with. For instance, photo interpretation gets better each day. Prisma, while on the surface is a simple app, is a major experiment in deep learning. More experiments will be made — and incremental advancements may make or break several startups this next year. A big watch out? People will be extra wary of embedded parameters — biases. Biases are required to load a neural network, but make sure algorithms aren’t unwittingly biased against certain groups. Another reason why teams will matter more and more in 2018: a diverse team can help combat biases and has been proven to lead to better products. Things are about to accelerate for digital product designers and developers, especially as we see cross-platform solutions take off, blurring the lines between web and mobile development. Nurturing talent and ensuring teams are structured around these new ways of working will be more critical than ever as mobile app development gets simultaneously more streamlined and more complex. The biggest opportunity — and hurdle? This is the year to evaluate how digital product teams are organized, and that those teams are focused on the right technology platforms to meet your app’s goals. Those that can adapt will be leaps ahead in creating modern mobile experiences. If you’d like to speak to Tiago Luchini in our upcoming Afterhours session, apply here for TNW New York tickets. Click here for more info on event, the amazing speakers and the venue.